Choosing true wireless earbuds is essentially a two-step process. In the first step, you want to ensure basics are in order. You want to know the earbuds sync properly, connect smoothly, and so on. In the second step, you start to scrutinize the particular audio attributes you’re after. Is sound quality your biggest priority? Is it call clarity? What about comfort? Naturally, you want all of these things. And almost every pair of headphones will claim to have them all. But unless you’re spending thousands of dollars, you’re almost certainly going to be making compromises. What those compromises look like is really what defines a good pair of true wireless earbuds. 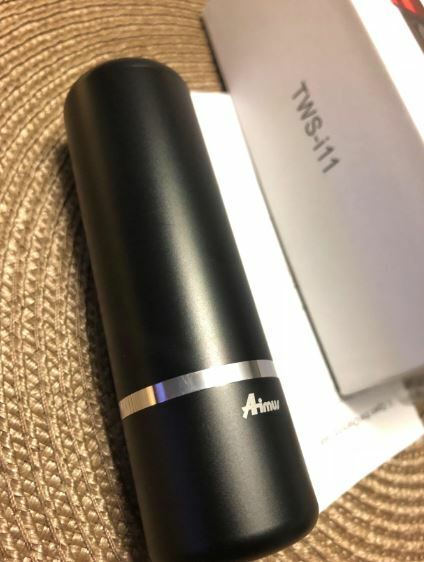 The Aimus i11 True Wireless Earbuds both do and do not seem to be regular earbuds. They’re basically the result of several unique design decisions combined. What you end up with is lightweight earbuds made for calls, comfort, and casual listening. In most ways, the i11 are not an attempt to reinvent the wheel. They don’t have any truly unique features, but they do combine a variety of essentials with smart design. For example, like many high-end earbuds, all functions of the Aimus i11 can be accessed through touch surface controls. The chassis of each earbud and the case itself enjoys IPX5 waterproof protection. A more apt name might be sweat-proof protection because it’s only equipped to handle small quantities of water. The so-called waterproofing is the result of a hydrophobic nano-coating. 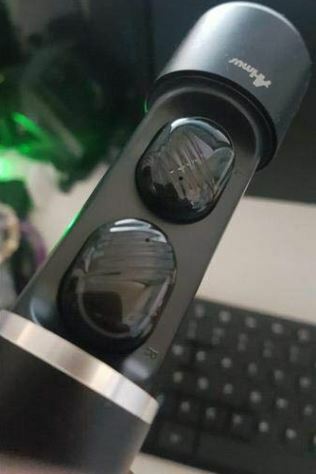 It’s basically a fancy spray which is applied to the earbuds, and forces moisture to roll-off them like oil and water. But the design provides virtually zero protection from submersion. While every pair of true wireless earbuds with a charging case is portable by definition, the Aimus i11 uses a charging case that’s among the most portable on the market. The casing is somewhat unusual. It’s a long cylindrical case that loosely resembles a tube of lipstick. It slides open with one smooth motion, revealing both earbuds. Each earbud is kept in place with a mild magnetic force. 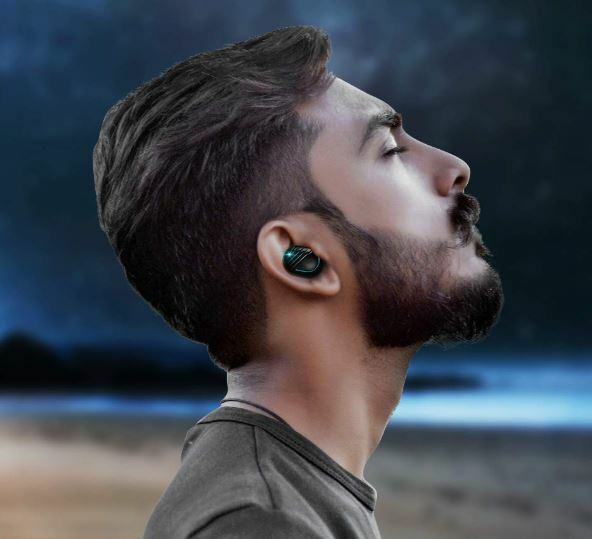 And beneath each earbud, there are a pair of connection pins to make the wired connection necessary to charge with the case. Once you get used to the layout, you can pop in your earbuds with little thought or effort. The Aimus i11 are available in either black or red. The black looks more like an ordinary pair of headphones, while the red has a more distinctive style intended to catch the eye. The red casing includes black earbuds. Both types use a small teal LEDs, which runs along the base of the earbud. 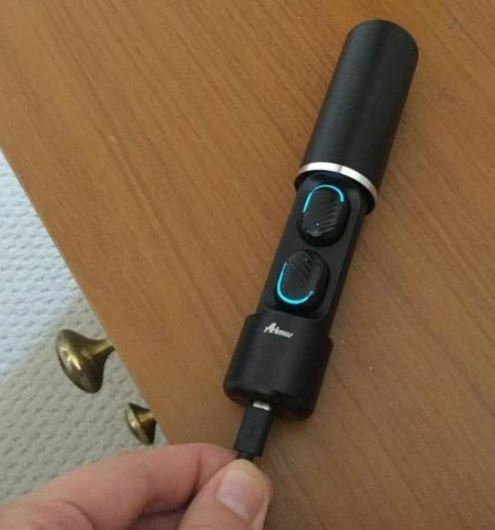 Though these earbuds LEDs draw very little power, they can be disabled. 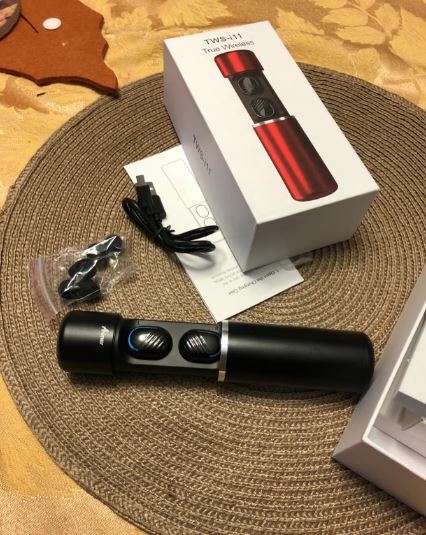 Aimus i11 connect with the help of Bluetooth 5.0, enabling a signal across roughly 50 feet. Bluetooth 5.0 comes with a variety of small benefits, including automatic pairing features. Consequently, the Aimus i11 is good at remembering the devices you want to connect with, and getting that connection started when you want it. Along the bottom side of the case, you’ll notice a micro-USB port and a small LED. The USB port is for charging, while the LED indicates the battery life of the case. It’s a simple but effective design. The cylindrical body of the case is also far more resistant to damage than more common square charging cases. Square cases that operate with a hinge are only as sturdy as their hinge. Such cases are also prone to developing squeaking noises over extended use, so it’s nice to see alternatives like this. Aimus i11 True Wireless Earbuds are constructed with a fairly small 40mAh lithium-ion battery in each earbud. They probably aren’t going to win any awards for innovation or longevity, but they perform about average relative to similar true wireless earbuds. The battery is capable of providing about three or four hours of music playtime. Precisely where your battery total will end up depends on a number of different factors, from the level of volume you enjoy, to the temperature of the room. But barring extremes, the 3 to 4-hour estimate is pretty close to what you can expect. The battery within the charging case is literally ten times larger than the battery inside each individual earbud. It’s a 400mAh lithium-ion battery, which allows you to pull about four charges from the case before you need to recharge it. When you’ve got all that battery life added together, it works out to about 300 songs and ten movies. The charge time for the earbuds is between thirty minutes and an hour, depending on how drained they happen to be. The charging time for the case is about two hours. Again, that depends on the status of the case before initiating the charge. If you’re really looking to stretch the battery life, or you’re in an environment where you can only use one headphone, then you want mono mode. By only using one earbud, you can effectively double the battery life of this setup. And for situations where you can get away with using only one earbud, features like this are nice to have. However, you need to use the right earbud in mono because the left cannot be used independently. The left earbud is the slave-bud which is designed to take instructions from the right. The Aimus i11 makes use of dual stereo microphones, with one microphone on each earbud. This binaural microphone configuration draws data from both microphones to help capture your voice during a call. By having two microphones and placing them apart from each other, sound engineers can achieve many different interesting things. The Aimus i11 True Wireless Earbuds have used this design to help recreate your voice with more depth. As a result, it can help it recreate your voice in 3D stereo sound, as though you were standing in the room. And that’s great for calls because the kind of clarity you get is nothing short of excellent. Another thing multiple microphones can do is create better noise cancelling effects. But these microphones were not put to that task. Aimus i11 includes three sizes of ear tips. That’s pretty standard for any pair of earbuds these days. And it ensures more than 99 of 100 people will be able to find a good fit for their ears. Getting a comfortable fit is usually as simple as being able to select the right size of ear-tip. The ergonomic design of these tips makes the process about as simple as trying one or two different sizes. Though not explicitly athletic headphones, when you’ve taken the time to choose a properly sized ear-tip, the Aimus i11 True Wireless Earbuds are designed to stay firmly within your ear throughout a busy day. Until you have a doctor measuring your ears and designing a device to sit in your ear specifically, there will always be room for improvement. Some high-end earbuds include half-a-dozen different ear tips to choose between. But again, most people are certain to find the three sizes sufficient. If you tend to need exceptionally small ear tips, you may be the exception. The controls are fairly intuitive to use. Touch either earbud once to play or pause. Touch the right earbud twice to drop volume, or twice on the left earbud twice to raise it. A three second touch on either earbud can skip between tracks. Similar touch and touch-again controls are used for calls, as well as accessing Siri. And while native support for Siri is fantastic, unfortunately this support does not extend to other popular voice assistants. Each earbud makes use of fairly large 10mm audio drivers. Many in-ear drivers are as small as 6mm. Because the Aimus i11 have used a slightly larger body, which is intended to rest inside the ear canal, they’re capable of using these slightly larger drivers. The driver is also positioned slightly further away from your ear than with 6mm variants. With impedance of 32Ω, the Aimus i11 are actually rather power-thirsty for such small earbuds. At the end of the day, their sound quality might best be characterized as high-average. They do recreate a pleasant, balanced soundstage. But you’re not going to find a brilliant redefinition of mobile sound. Many headphones in this price range try to create strong bass through various software tricks, it usually comes out sounding muddled, unclear, and bloated. The Aimus i11 avoids the temptation of pandering to people who love bass, and instead focuses on a creating earbuds which are approachable for almost any genre of music. All in all, audio quality for the Aimus i11 True Wireless Earbuds will probably not blow you away. But it’s certainly nothing to scoff at. If you’re someone who’s used several pairs of wireless earbuds, you might even be surprised at what the i11 can do. The Aimus i11 enjoys wide compatibility with essentially any device you’d want to plug them into, including Apple phones, Samsung phones, Sony phones, Microsoft’s phones, and so on. 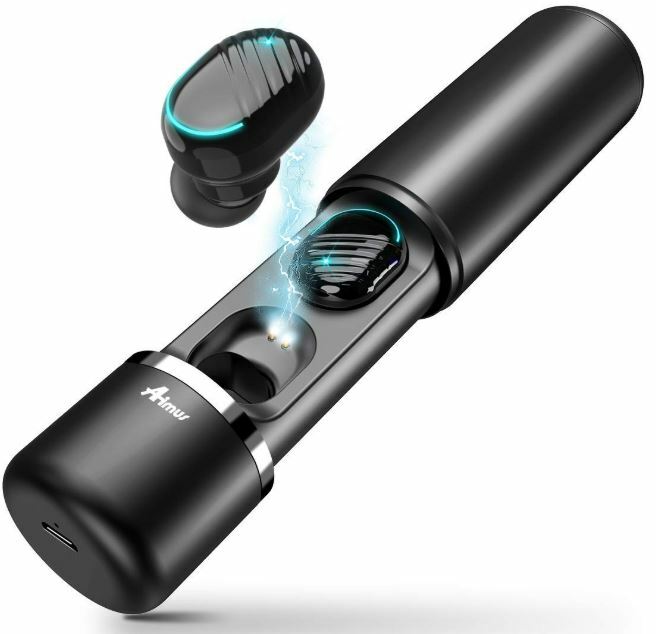 Aimus i11 True Wireless Earbuds include a charging case, micro USB cable, user guide, and three pairs of additional ear tips. They also include a 12-month warranty. Who Should Choose Aimus i11 True Wireless Earbuds? The Aimus i11 are widely adaptable. They’re not exactly athletic earbuds, but could be used for athletics. That general ruggedness makes them a good choice for your daily driver in almost any mobile-audio circumstances. Being able to switch to mono mode doesn’t hurt, either.